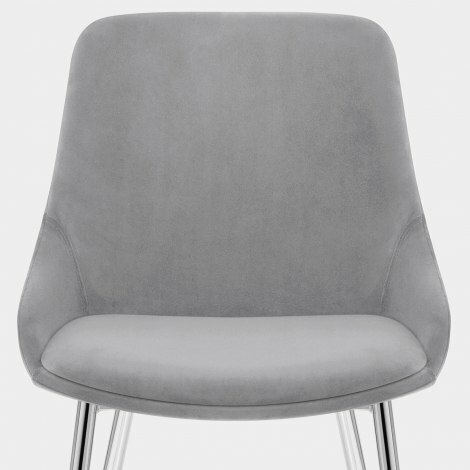 The Aston Dining Chair Grey Velvet has a smart and exclusive look that will infuse your dining area with modern magnificence. Exuding sleek modern style, the Aston is bang on trend and will surely take centre stage in your kitchen or dining area. Plush grey velvet upholstery gives the seat a soft touch, whilst dense foam padding provides excellent comfort. Offering necessary support, the ergonomic backrest curves round to surround the feature seat pad. The four polished chrome legs gracefully taper to the floor and create a strong and sturdy frame, whilst the protective plugs underneath help to look after floor surfaces. "Very pleased with my dining chairs"
Shopping online is always chancy but I am absolutely delighted with these chairs, they are comfortable & look good too. Delivery was also excellent. Thank You. Couldn’t be happier with my chair, it’s exactly what I wanted and although it was out of stock when I ordered it, I was advised I could still have it and it was worth the wait. Very pleased with my dining chairs that I received today. They are exactly a true liking to the image and look perfect in my room. The whole shopping experience with Atlantic has been great, although I had to wait a while for the stock to be available I was kept informed by email and the delivery date was as promised. On the day of arrival I was again given an accurate time they were due first thing. The only reason that I didn't give the top rating for quality was that they're quite light (weight) but for the price you can't complain.